When I began my blog back in 2009, it felt like only a handful of sites for the prop maker were out there. Since then, the field has practically exploded and you can find information everywhere. I post links to sites regularly, but I wanted to make a list of the sites you should be checking out regularly. So I’ve collected and categorized what I consider to be the 100 best sites for a prop maker. Now, this is far from comprehensive, particularly if you are working on specific objects or using less-popular materials, but hopefully it will keep you busy for awhile. If you know of a site I’ve missed, drop a note in the comments or send me an email! Forums remain a great way to find information about prop making, since much of what we do is so specific and unique. You can ask a question, search for answers to other questions, or just browse through and pick up tips on how other people work. Replica Prop Forum – A very active and very informative forum filled with fans recreating their favorite props from films, television, video games and other media. ControlBooth – A US forum for technical theatre, with a small section on props. Blue Room Technical Forum – A UK forum for technical theatre, also with a section on props. Cosplay – For fans of dressing up as fictional characters, this also has sections on props and similar items. PropPeople Forum – A once-thriving forum that still limps on, this is the only one devoted entirely to props people working in theatre. TheatreFace – Forums built around the TheatreFace social network, with a section on props. The FX Lab – Special makeup effects, mask making and creature design. Haunt Forum – Lots of information for those who build their own sets and props for Halloween displays and haunted houses. The Clubhouse – For modelers, sculptors and model collectors. Concept Art – Forum for concept artists with a small section for sculpture and other 3D media. Many prop makers have their own website or post their work online, but a few go the extra mile and show how they’ve built specific props. Volpin Props – Unique commissions for props and objects based off of items from video games, television and films. Punished Props – Another fine replica artist making props from video games and other pop culture. Fake ‘n Bake – If you ever want to make fake food, Anna Warren’s site should be your first stop. Dave Lowe Design – One of the prop masters at the Hallmark Channel. Kamui Cosplay – Armor and cosplay from Wonderflex and Worbla built by this talented German artist. Blind Squirrel Props – A replica prop maker working on commissions and personal projects from all manner of films, television shows and video games. Folkenstal – Interesting weapons and items based on the video game Skyrim. Theatre Projects – Props and prop-related information from a freelance theatre prop master in Chicago. Amethyst Angel – Armor and other cosplay projects. Jay Surma – Another prolific replica prop maker. 2StoryProps – Yet another replica prop maker. MRX Designs – A prop maker working in the Steampunk and Lovecraft genres. Tom Banwell – Leather and resin Steampunk projects. Barnyard FX – A behind-the-scenes look at the props, exhibits and displays by Greg Aronowitz, a prolific special effects artist and design specialist on over two hundred films and television projects. Spirits Dancing – Puppetry and prop-making from Hilary Talbot, a working Australian artisan. Fevereon Props – A prop and costume maker out of Georgia. A number of sites may not be devoted entirely to teaching prop-making, but they still have regular tutorials, news and information relevant to the prop maker, or deal with comparable and related industries. Prop Agenda – Now, I couldn’t omit my own blog. How-tos, news, videos and more from the props world. Make Magazine – Blog companion to the magazine, this site regularly has posts on prop making and associated materials. Tested – What began as site for testing consumer electronics has quickly grown to have regular features on props and prop making, particularly with Adam Savage as one of the regular hosts. Propnomicon – A regularly-updated look at props built around the mythos of HP Lovecraft. Lost in Schlock – Down and dirty prop making tips for low-budget films. Design Realisation – backstage at the Guildhall School of Music & Drama. La Bricoleuse – costume crafts teacher at University of North Carolina Chapel Hill. StageBitz – a prop inventory software company that regularly posts prop-related news and interviews. David Neat – Theatrical model making. Stan Winston School – The new school run by the peerless studio responsible for the most famous practical film effects of the last thirty years runs a blog of related information. The school also has online video classes you can take for a paid subscription. Meanwhile in the prop shop… – A Tumblr of random encounters in a regular props shop. Theatre Safety – Articles and information on safety in the performing arts. Technical Direction Tidbits – News and tidbits from the world of technical theatre. The Dark Power – Bizarre sculptures and metal art with a theatrical flair. Design*Sponge – Inspiration and reference for all manner of interior-design and furniture-related things. Fake Believe – A behind-the-scenes look at props and sets made for various photography projects. Haunters Digest – Tutorials and showcases of haunted house props and Halloween decorations. If you need to learn how to build specific items or work with certain materials, these sites have collected the information you need. Instructables – If you need to build something, chances are, you can find a tutorial here from someone who has already built it. This site should be your first stop for finding how-to’s, period. Smooth-On videos – Tons of videos on molding and casting. Deviant Art – You have to do some digging, but people post a lot of tutorials here, or post props with a detailed “how-to” in their description. Woodgears.ca – Wood working by an engineer. Hirst Arts Fantasy Architecture – Tutorials for molding, casting and painting of miniatures and models. Ultimate Paper Mache – Information and tutorials on, you guessed it, paper mache. Monster Makers – You may never need to make monsters, but you may find their tutorials on sculpting, molding and casting, working with foam latex and painting to be helpful. Paint-Sculpt – Tutorials and reference for both painting, and, wait for it, sculpting. The Gizmologist’s Lair – A cornucopia of tutorials and links to all manner of gizmo-related projects. Craftster – Projects and tutorials from the crafty side of the prop-making spectrum. Mask Makers Web – Information and links for things related to masks and mask-making. Costume Properties Construction Handbook – An online book of sorts with helpful information on building objects like hats, armor and masks. Puppetry Home Page – Information on building puppets, and lots of links to other sites. Fastener Information – Everything you want to know about bolts, screws and similar fasteners. This to That – Interactive tool for selecting adhesives for specific materials. Golden Paints virtual paint mixer – Pick a color and this site will tell you which acrylic paint colors to mix to get that color. Glass Attic – 1700 pages of everything you need to know about polymer clay. Green Theater Choices Toolkit – A rundown of common building and crafting materials ranked by their environmental impact. Sizes – A vast index with information about the sizes of practically everything. From definitions of units of measurements, to standard sizes of common furniture, to sheet metal gauges, and everything in between. Pocket Guide to Chemical Hazards – A guide to help workers recognize and control common chemical hazards in the workplace. Wood Database – Pictures and information for identifying or selecting hundreds of types of wood species. Toxipedia – Encyclopedia of toxins. Arts, Crafts & Theater Safety – Provides health and safety information to artists worldwide. Beacon Adhesives Adhesive Selection Chart – Like “This to That”, but dedicated to adhesives from the Beacon company. Colorit Color Formula Guide – Pick a color to see which RIT dyes to mix to get that color. Chemistry in the Toy Store – A look at the chemistry of various toys, including recipes to make your own slime, play dough, disappearing ink and other novelties. 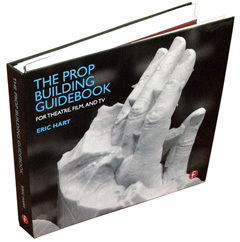 Properties Directors Handbook – An online book showing how a theatrical props shop is setup and organized. Internet Movie Firearms Database – A comprehensive look at every firearm from every film, whether it was a real gun or adapted into a more fictional weapon. Production Illustration and Concept Design – Artwork from the planning and pre-production phase of dozens of films. Woodworkers Library – Over 200 out-of-print woodworking books you can read online for free. Collectors Weekly – One of the best sites devoted to delving into the history of specific objects and antiques. Retronaut – Lots of pictures and illustrations from throughout history, organized by theme or event. Accidental Mysteries – Strange, bizarre and magical art and objects from today and the past. Smithsonian Institute 3D models – Scanned three-dimensional computer files of some of the objects from the Smithsonian’s vast collection. Library of Congress Digital Collections – Digitized versions of the LOC’s many holdings, including one of the largest historical newspaper archives around. New York Public Libary Digital Collections – Tons of digitized content from the NYPL’s collections, including their vast theatre and performing arts collection. American Museum of Natural History photo collection - A look at various items in their collection, as well as some behind-the-scenes photographs taken during the construction of their famed dioramas. Science Museum History of Medicine objects – Thousands of objects used by doctors and other practitioners throughout history. The History and Geography of Inventions – Find out where and when many common items first appeared. Click Americana – Memories and memorabilia from US history. National Park Service Museum Collections – Lots of items and objects from their various museums and parks around the US. American Package Museum – Hundreds of images of vintage and antique cans, bottles, boxes and other packages from the US. Finally, if you want to join a larger community of props people or find a job in the industry, check these sites out. S*P*A*M – The Society for Props Artisan Managers is an organization of North American prop directors. USITT – The United States Institute for Theatre Technology. ArtSearch – A paid subscription site with job postings for US theatre and educational theatre. Backstage Jobs – A free site for job postings around the US. Set Decorators Society of America – An organization of Hollywood set decorators with some in-depth looks at the work of their members. Thanks so much for including me in your list, Eric.